"This is an old family favorite recipe prepared every Christmas, and I wanna tell ya it's GREAT! It is from the kitchen of my mother, Charlene Betty Stephenson. Thanks Mom!" Dissolve raspberry gelatin in 1 cup hot water. Add frozen raspberries, and stir until well mixed. Pour into a glass bowl. Refrigerate until almost firm, about 30 to 60 minutes.. Spread sour cream over firm gelatin. Refrigerate. Dissolve cherry gelatin in 1 cup hot water. Stir in crushed pineapple and cranberry sauce. Chill until partially set, about 20 to 40 minutes. Spoon cherry gelatin mixture over sour cream layer. Chill until firm, another hour or two. This is a great salad- I only use 1/2 the recommended sour cream. It tasted too much like yogurt with the full amount. I will make again and again! Excellent compliment to turkey! This will be a new favorite! 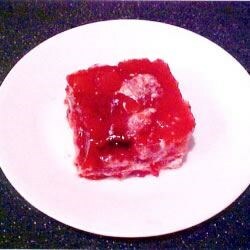 I used all raspberry jello and added a bit of cream cheese with the sour cream. SOOO good! Thank You so much for this recipe. It was a great hit for our Christmas dinner. I wasn't sure about the sour cream but it was fine. Thanks again. I will be making this again!